Beth Nahren, Assyria (ATOUR) — Akitu, the 6759 year traditional festival of the ancient and modern Assyrians, was celebrated with a great parade and concert. Assyrians from all parts of our homeland and the Diaspora came together to share and promote cultural awareness and pride in our ancient, inherited identity. Spring represented an annual revival of life and gave hope to Assyrians weary of the past winter. The Assyrian New Year is celebrated for 12 days, beginning on March 21st of every year. In an important reminder of the volatile and continued harrassment of Assyrians living in Iraq, the regional Kurdish authority refused to grant permission for this parade earlier in the week. Assyrian Democratic Movement (ADM), the organizer of the parade, vowed to proceed with the parade. 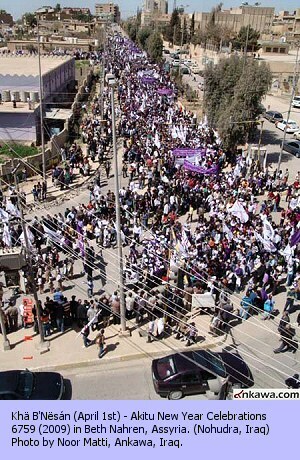 To avoid negative publicity, the regional authority reluctantly reversed their decision and granted the permit after protests from numerous Assyrian activist groups. Your browser does not support HTML5 video in MP4, OGG, or WebM formats. Download: Right-click on the Ipod icon and choose "Save Target As" to download the file. 1. Open iTunes and click "File" to find and add this video to your iTunes library. 2. Plug in your iPod to your computer, then iTunes will detect your iPod as a device. 3. Select your iPod device on the left panel of iTunes, click "Movies" tab, find and check this video to sync and click "Apply".